Home › Features › FDA V.S. TPD: Vaping Regulations. The fight against unreasonable e-cigarette regulations by consumers and organizations have been nothing less than fierce from both sides of the pond. The difference between two continents – allies in the world – is similar, and astoundingly different. The regulations set forth in the Tobacco Products Directive (TPD) and the now released Food and Drug Administration (FDA) are claimed to “protect public health”. I do not completely understand every detail, but know restrictions are imminent and wrong for public health. Both want nicotine regulated as “tobacco”. Both, to some extent, want control. There have been handouts experienced by (both) governments in the process via scare tactics and propaganda. Popcorn Lung, for example is a concern along with everything else tossed haphazardly into the media – blown out of proportion immediately. Precision media bombing and controlled chaos is just a way to report, evidently. Few in the national / international media circuit(s) can do an unbiased and truthful report. The media has assisted, volunteered in fact, in tossing out every study done without due diligence or proper review. No surprise, less important were the retractions obtained. The people and organizations who are in the care and custody of “public health” quickly take advantage by saturating the public news & social media feeds, thereby altering public opinion further away from vaping products as a choice for harm reduction. Our favorite horses asses have done a wonderful jobs, as they will do, regurgitating the opinion of the “science” with their vast knowledge of – well, being horses asses. Chewing on their cuds. Wait, those are cows. Anticipated for quite some time, the FDA has released their deeming regulations containing 499 pages of defining nicotine as a “tobacco” product. They’re convincing the American public it is in the good name of public health. Oh, yes. It’s because they are concerned about protecting public health. For the protection of public health. “Tobacco product” and “public health”. This final rule has two purposes: (1) To deem all products that meet the definition of “tobacco product“under the law, except accessories of a newly deemed tobacco product, and subject them to the tobacco control authorities in chapter IX of the FD&C Act and FDA’s implementing regulations; and (2) to establish specific restrictions that are appropriate for the protection of the public health for the newly deemed tobacco products. FDA is taking this action to reduce the death and disease from tobacco products. Deeming all “tobacco products“(including components and parts but excluding accessories of the newly deemed products) to be subject to the FD&C Act will result in significant benefits for the public health. To define e-cigarettes as “tobacco products” is the key to public health in the United States, evidently. The FDA has released what I’ve coined as the “Tobacco Harm Promotion Act”. There should be t-shirts and hats and such. I am a consumer. I am not an industry “insider”. I’m reading these regulations and finding there is not a care in the world for the consumer, or public health. Youth is mentioned various times. It’s like they’re convincing me this is about children. I direct you to the “point person” Mitch Zeller appearance on PBS. The title itself is a lead in to what would control the thoughts of the viewer. “Skyrocketing teen use”. Maybe it’s just me, but Zeller seems to be reading a script at about 3:00 and virtually ignores the question(s) by stating what he is told to say. Zeller looks so… natural as he repeats bleats the “public health” and youth stance. We don’t know… we’re making “Massive investments to get answers”… good for you, Mitch. You couldn’t call anyone across the pond beforehand? I know a few people…. you should’ve asked. Here is the PBS video and transcript. What the UK is doing seems to lean toward the “best interest” of public health. For some reason, the majority of health professionals see the potential for tobacco harm reduction as opposed to their American counterparts who see regulations as control. 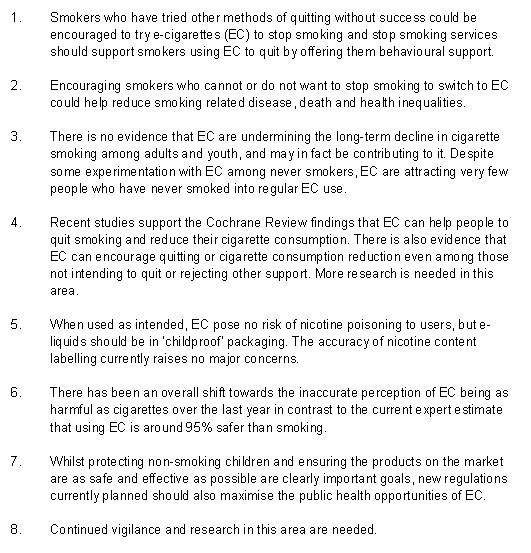 Among it’s 113 pages, there are sensible and common sense statements, including the debated “in some pastures” estimate that e-cigarettes are, indeed estimated to be 95% safer than smoking. Just recently, the Tobacco Advisory Group of the Royal College of Physician’s released it’s 192 page report “Nicotine without smoke“. A far and away comparision to the the United States, THIS is the investment in “public health” being made in the United Kingdom. Not perfect, it also takes the PHE stance of tobacco harm reduction, now to include e-cigarettes as another choice for smokers. E-cigarettes in my honorary land of black pudding, are now encouraged. 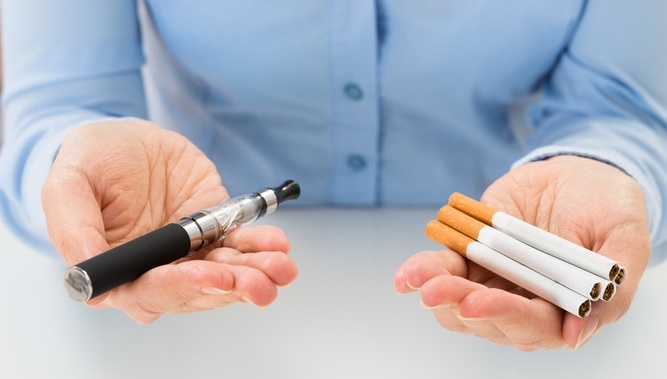 likely to become more acute as tobacco companies move into the licensed, as well as unlicensed, nicotine market, but that problem can be managed with vigilance and care. nicotine products as widely as possible, as a substitute for smoking, is therefore likely to generate significant health gains in the UK. This statement by the PHE and RCP is within reason, consistent with the Medical Organizations supporting Vaping and Electronic cigarettes (M.O.V.E) statement of 95% to 99% safer as a way of tobacco harm reduction. The MHRA, with the Tobacco Products Directive and consumer protection in mind, have their regulations taking place 20 May, 2016. The Public Health England and the Royal College of Physicians Tobacco Advisory Group have a total of 305 or so pages of commons sense approaches towards tobacco harm reduction for tobacco use as another choice with e-cigarettes, snus and the more traditional forms of nicotine replacements. In the United States FDA regulations are 499 pages of regulation. No tobacco harm reduction – no points showing there are studies and data and science to help tobacco users reduce or eliminate tobacco. There is, however, plenty of double-talk, rules, restrictions, and eventually, because they are the “authority having jurisdiction”, will begin the long path of continued promotion of smoking for those who don’t know they have a choice. This is all about revenue for the government, although the FDA doesn’t tax anything. They let someone else do that. I haven’t honestly cared to find out the “official date”……….with 499 pages of “regulations” for public health, the United States looks like it wants control of public health v.s. tobacco harm reduction. What do I call the FDA’s deeming regulations? ~The Tobacco Harm Promotion Act. Already ~as this is was being written ~ the FDA will be challenged, as coalition of various United States consumer and industry organizations have been announced on social media. The United States government is in for a fight. In my thoughts, the U.K. seems to be, despite restrictions on gear, nicotine strength, amount of liquid available and the other things I didn’t get into, better off where they are and moving forward on harm reduction. The United States is taking three steps back at the moment. I suspect the film about you and I – with corruption as the star, will change public perception shortly for the United States. A Billion Lives – will premier 11 May in New Zealand at the Doc Edge festival. I am humbled & honored to have the opportunity to be a guest within this site. I’d like to thank the evil editor of vapers.org.uk for allowing my guest post. Keep ON #Vaping & FIGHTING on. 1 Pings/Trackbacks for "FDA V.S. TPD: Vaping Regulations."